Poems written to order are seldom a good idea. It probably matters less, though, when poems are about school, parents and pets than when they are about war. And aren’t there already so many poems about war, often written by men and women whose lives have been, at least, touched and, often, irrevocably changed by it? I have in front of me Jan Mark’s excellent anthology for young people from 2003, A Jet Black Sunrise, including poems ranging from the Book of Isaiah to Simon Armitage and wars from the American Civil War to the Irish Troubles. 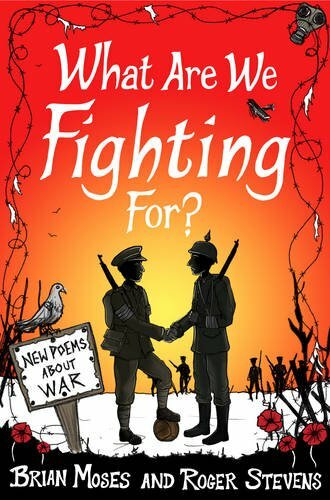 Do we need another book of poems about war for children? Possibly not; but, to be fair, Moses’ and Stevens’ collection of their own poems is for younger children, say upper juniors rather than older teenagers and, since the poems are mainly about the First and Second World Wars from a British perspective and published to coincide with the centenary of the Great War (as the image on the cover suggests), it is presumably intended to support the school history curriculum. So it rehearses a number of familiar themes: the 1914 Christmas truce in the trenches and the Second World War evacuation of children among them. However, the question posed by the title of the collection is not addressed in relation to these specific conflicts but in a shorter final section, prefaced by a quote from Gandhi about the permanent evil of violence, which gives you a clear idea of the answer. To be frank, we could do without a number of these poems. Why, for instance, a twenty first century poem in the form of a letter to the front, when there are so many originals to read? But there are some poems that are better, particularly those that relate a child’s experience to conflict, whether in the way that war, whether at a distance or close up, has repercussions on everyday life or in the manner that children’s lives and play shadow more profound and dangerous conflicts: Roger Stevens’ Sniper or his Hide and Seek. Similarly, it seems to me, the best of Brian Moses’ poems are about being a child in the home front of the Second World War: Safe, Eating Carrots, Sweets and, above all, My Father’s War, a quiet reflection on the common experience of those of us who grew up with fathers who had served in that war and who had seen horrors they never wanted to talk about and that we could never fully understand.